If you’re missing one tooth or a full row of teeth, dental implants create a natural looking, feeling, and functioning restoration option. We place implant posts, made from high quality titanium, into the gum line. 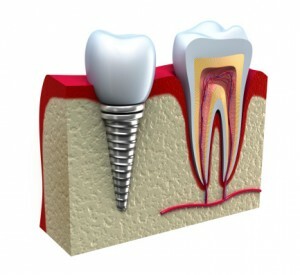 Once in position, dental implants fuse with the jawbone closely mimicking the function of tooth roots. As the only tooth replacement solution that restores both the root system and the portion of the tooth visible above the gum line, dental implants outshine all the other tooth replacement solutions available today. Still, dental implants aren’t the right treatment options for every patient. The best way to learn more about dental implants and all of the high quality tooth replacement options we offer at Polished General Dentistry is to schedule a tooth replacement consultation. Call our Carlsbad dental team to get started down the road to a lifetime of healthy, flawless smiles today. Completed in two treatment phases, dental implant supported tooth replacement starts with a minimally invasive surgical procedure. We begin by making an incision in the soft tissue. Then, the doctor positions the implant post to provide optimal support and stability for the tooth replacement prosthetic. We place a protective cap over the top of the implant that keeps the gum tissue in the right shape and protects the implant post as it fuses with the jawbone. Once this fusion process is complete, patients return to our office, and we attach a custom-crafted, natural-looking tooth replacement. The entire process is time consuming. Patients need to commit to months of ongoing maintenance and dental visits, but the results are long-lasting, beautiful smiles. Improved stability – implant-retained dentures restore 70% or more natural chewing function compared with just 20 to 30% possible with removable dentures. Improved longevity – fixed bridges, partials, and dentures need to be repaired or replaced every five to seven years. Implant-retained prosthetic last for decades. Improved appearance – many people notice that even the most flawlessly crafted dentures and bridges are not natural teeth, but implant-retained restorations look just your like healthy, beautiful smile. Improved whole mouth health – by stimulating bone and gums, dental implants allow patients to maintain optimal levels of jawbone density and soft tissue volume. This means facial shape remains youthful and natural, and risk for further tooth loss decreases significantly thanks to stimulation from dental implant posts.